Very nice. Looks attractive on my husband’s wrist. This unique Diesel watch has an intricate face with dual time and chronograph capabilities. This stylish and functional timepiece is finished with a comfortable leather strap. I saw this watch with my boyfriend*****. I was able to purchase this watch here for $60 less with free shipping. The watch looks great, it's lighter than he expected, and works well dressed up or casual. I had a great experience purchasing it here and I'm definitely checking here first for future purchases. To say I fell in love with this watch when I first saw it is an understatement. I absolutely LOVE it. 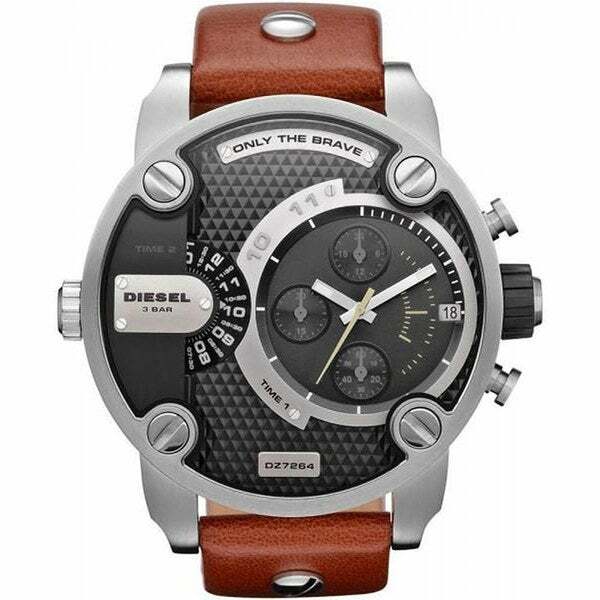 Nothing can compare to the feel of authenticity of this Diesel watch. It's been a solid buy so far! I look forward to building my Diesel collection. This diesel watch is one my husbands favorite of his collection. The watch is big and vert trendy and wears well. It has a lot of nice features as well which my husband says makes the watch so great. Gave this as a gift to my cousin. He loved it. It was a Birthday gift for my husband and he loved it!!! Exactly what I ordered. I love it!! Rugged look, oversized face, leather band, solid review.